Tips to Declutter Your Home Today – and Keep it that Way! Life happens fast, and your daily life seems to accumulate in all this stuff! Have you always had this much stuff? Where did your kids find all of these toys? Where does it all belong? Well, spring has sprung, and it’s the perfect time to do some good old-fashioned spring cleaning… So we’ve got some easy tips to help you declutter your home, and keep it that way! Though it may seem counterintuitive at first, you do not want to buy organizers before you start decluttering. You’ll want to organize with what you have first, taking an inventory of all of your stuff in order to figure out which organizing pieces best suit your needs. So often we underestimate what we actually need, and overestimate what we think we need. Don’t get saddled with excess, unused organizers. Know what you’ve got and where it needs to go first! … or even one weekend! It’s not that we don’t believe in you: we know you can accomplish anything you put your mind to! But when you spread your decluttering across several days, in two to three hour increments, you maintain better focus and energy throughout the entire decluttering process. It is so easy to get overwhelmed or discouraged when decluttering and organizing. Don’t set yourself up for failure: plan on decluttering throughout the course of the week! When setting aside your two to three hour increments of decluttering, make sure you clean fully. If you leave a project or task half-complete, it will be even harder to fully commit to it later. Complete each project thoroughly. When you declutter with care you organize more effectively, keeping the clutter from re-accumulating. Grab a big, black trash bag and walk your house from top to bottom, and front to back, and nab anything you see that you know can be thrown away. Getting rid of this initial layer of “stuff” can help you approach organizing more efficiently and effectively. 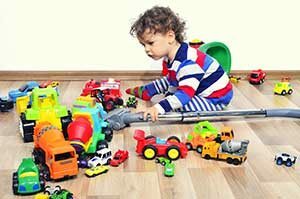 This West Coast Mommy has fantastic suggestions for organizing, optimizing, and decluttering your children’s toys. Discard broken toys, and donate neglected ones. Store toys long-term that seem to only have a seasonal grip on your children. Have little toy-storage sections throughout the house, in a range of containers, to maximize space and encourage clean-up once playtime is done. Taking care of toys not only decreases the clutter around your home, it also encourages your children to take care of their own things, instilling a sense of value at a young age. Sure, the catalogues make storage seem so glamorous. They offer flashy ways to declutter your home, clever ways to store your shoes, and pretty ways to maximize your kitchen space. But unless your living room is straight out of Ikea, your space is probably not optimized to adapt to those intense catalogue organizers: and it’s not realistic to expect it. Don’t undermine your decluttering accomplishments by getting caught in the catalogue trap: “It looks good, but not that good!” Your home will look beautiful, unique, and perfectly decluttered when you’re done with it–let that be enough! Unused toys, unworn clothes, and other items that are often forgot about or gently used are perfect to donate to a home or family that could really use them. 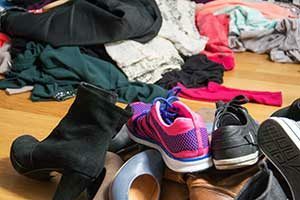 Your closet and dresser drawers are the most egregious culprit of clinging clutter. When assessing your clothes ask yourself two questions to determine whether the item should be kept or donated: 1) When was the last time I wore this? 2) When, in the near future will I wear this? Also, don’t let nostalgia trap you into keeping useless junk– the memory will live on despite the clutter. Be willing to throw away old toys and items, despite what they use to mean to you. There are so many ways to cleverly embrace baskets, bins, hanging organizers, hangers, drawers, jars, and so much more. The key is to make sure the organizer easily fits the things it’s storing so that in the future everything goes back to its designated place with ease. Be open-minded when approaching organizing–think outside the…organizer! Consider hooks, ottomans, hanging pockets, racks, under-the-bed drawers, and other great organizers! This can even help you maximize the storage containers you already own instead of wasting money, and space, on new ones! Entrust the decluttering of rooms to their owners if you know they don’t have pack-rat tendencies. Your kids will know how to best organize their rooms because they use all of the stuff in them every day–they know what can go into long term storage, and what they know they’ll be using daily. Dividing and conquering with family can make the whole decluttering process go a lot faster, and prevent it from being overwhelming. You just want to make sure that no-one will take the opportunity to hoard clutter, or haphazardly push clutter into hiding. If everyone is on the same page, then decluttering together can be super effective. Every home has a weak spot. A place where clutter easily, and quickly, accumulates. Maybe it’s the front door, where shoes and backpacks and dog leashes are all discarded with haste. Maybe it’s your bedroom, where clothes grow on the floor as you rush to get ready in the morning, flinging unwanted outfit after unwanted outfit out of your way. Maybe it’s the garage, that easy catch-all space that you often imagined would be used more effective. Maybe it isn’t an area of your home, maybe it’s a thing: maybe you’ve always got loose papers lying about, or shoes strewn everywhere. You want to have a place for all your things in all the areas where it is needed. Consider a shoe-cubby by your front door, and hooks for coats and leashes. Have ready storage for loose papers floating about that does not require detailed filing. When everything has a place to be easily stored, you decrease the future accumulation of clutter. Emphasis to yourself, and your family, how refreshing it feels to have a decluttered home. When you love the cleanness, you’ll want to keep it that way. 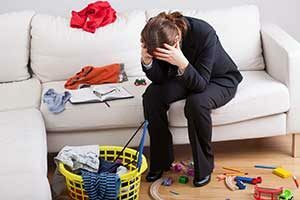 Remind yourself and your family that it is always easier to maintain a clean home than it is to declutter a messy one. Celebrating your home’s decluttered look ensures you keep it that way for longer!